digging – Treat. Play. Love. Which dog is for you? I would like to introduce you to two of my canine friends, Wilbur and Tedda. As you can see, they have many similarities, but they also have many differences. They joined the family about the same time, and each has come with their own unique set of characteristics. Wilbur is a real dog, living and breathing. From puppyhood he has shown an interest in his surroundings. He wants to investigate, meet people and dogs, he loves to chew, run, bark, dig, and play. He gives me feedback on my actions in the form of body language and behaviour. He has good days and not-so-good days. He has likes and dislikes. As Wilbur’s owner it is my responsibility to help him meet his needs on a daily basis, to provide him with good choices so he can keep busy and active without leaving a trail of destruction in his wake, and to provide him meaningful feedback in the form of training and interaction so that he knows what behaviour leads to good things happening in his day. 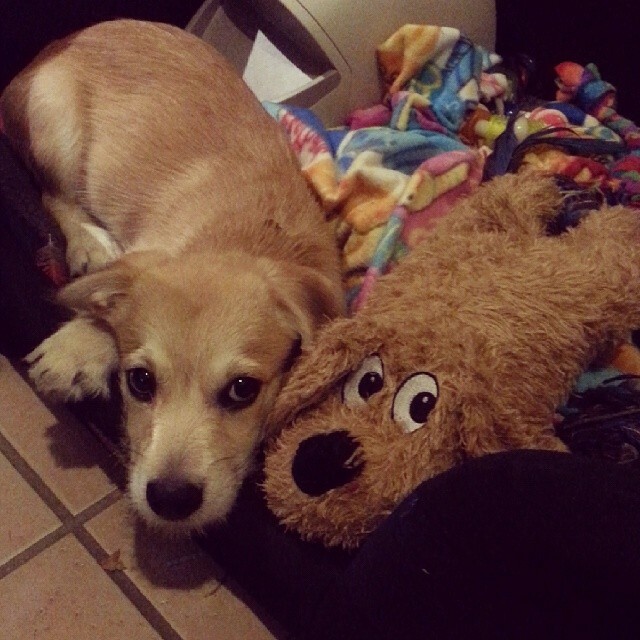 Tedda is a stuffed toy, designed to be played with by dogs. He has squeakers, which can be annoying, but his list of annoying behaviours ends there. He sits around looking really cute, and he’s soft and cuddly when i feel so inclined to interact with him. He doesn’t make a mess (unless Wilbur tries to de-fluff him), he is quiet, and he has very cheap upkeep. He doesn’t ruin my stuff, and i have no need to spend any time training him or teaching him to behave in ways i like. He is a very easy addition to the household. Unfortunately many people acquire dogs thinking they will behave like stuffed animals. Seen but not heard. Still and quiet until called upon to spend a short time doing dog-stuff: fetch, belly rub, walk. Punished for engaging in other dog behaviours: barking, digging, chewing. There is no time given to teaching our dogs good outlets for these behaviours, and too much time given to trying to quickly suppress these annoying characteristics. Dogs are not pre-programmed at birth to know how we want them to behave. They do not know, automatically, right from wrong. They don’t know we will be upset when they chew up our shoes, pull on the lead, or dig up our lawn, they just know it is great fun. When we invite a dog to be part of our family, we need to do so with a commitment that we will help them to be the best dog they can be. We will provide them with the training, enrichment, socialisation, and exercise that will let them show us how awesome their doggy behaviours can be. If this is too much responsibility, then you can purchase a Tedda from your local pet store instead – they are very cute!